Today I made a new blouse for Elizabeth. I absolutely love how the blouse turned out...and so does Elizabeth! Our garden is really coming along nicely. Here is how loaded our Serrano Pepper plant looked this morning before Elizabeth picked the peppers. Here is how one of the Jalapeno Pepper plants looked before I started picking peppers this morning. It's hard to see them but the plant is loaded. We have several bell pepper plants; these should make colored peppers. And I'm not sure but I believe this pepper will be black. If it's what I remember we will be using it to make enchiladas sauce. The mice dug up all but one row of the green beans when I first planted them. To keep this from happening a second time Elizabeth and I planted the second batch in plastic planters and then transplanted them once the plants were established. We have sweet peas growing, my plan to use the fence as a trellis isn't working; so far the plants keep attaching themselves to the tomatoes and weeds. Our tomato plants are tall and bushy and oh so heavy. After a windstorm earlier this summer the plants all fell over; to solve this problem I wired the tomato cages to the fence. My cucumbers are growing and spreading everywhere. I have noticed they are now growing outside the fence; guess the rabbits will soon find this and begin feasting on the cucumbers once they start growing. I plan to freeze this first picking of Jalapeno Peppers so I can use them in homemade salsa once we start getting an abundance of tomatoes. I'm not sure if I'll be freezing the Serrano Peppers or giving them to a friend who loves this variety of pepper. I have a feeling these are going to be a little too spicy for us. While searching for worms on the tomato plants we spotted two tomatoes hidden deep in the middle. I'm so anxious to cut into these later today. It shouldn't be long before we will be harvesting cucumbers; I love how cute they are in the beginning. Today's picking...it's amazing how colorful fresh garden produce can be. I hope to start planning our fall garden soon; carrots, broccoli, cabbage and lettuce are some of what I would like to grow next. With all the problems we had getting our garden started this year, it's hard to believe we are now seeing the fruit of our labor. This evening I picked our first tomato; it was a nice large tomato that fit nicely in the palm of my hand. We all shared the tomato and marveled at the wonderful flavor. 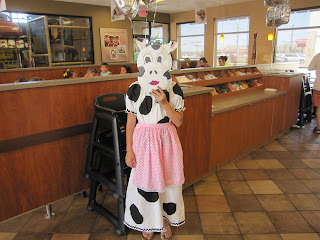 For this years Chick-fil-a's Cow Appreciation Day I made Elizabeth into a true "cow" girl. The dress was made with basic white muslin fabric; I then took black fabric and cut it into various shapes that were stitched randomly around the front and back of the dress. The pink apron represents the cow's underbelly. And the mask was made with paper plates. I tried to enter her photo in the Chick-fil-a photo contest but for some reason the web site keeps giving me an OOPS! response. We love homemade cobbler, especially peach. So when one of our local grocery stores ran their peaches 50-cents a pound.....I bought a lot. The freezer is slowly filling up with all the peaches I have peeled and sliced over the past 2-weeks. And each time I add more bags to the freezer I dream of all the warm cobblers we will be eating this winter. My favorite tea is sun tea but today I decided to try my hand at brewing tea. I have always loved enamel pots and pans, this one used to belong to Pat's grandmother; thankfully I am the current owner of her small collection of enamel pots. Since the pot is so small, barely large enough to boil an egg, the water heated up quickly turning into a nice dark concentrated tea in not time at all. Next I put sugar into this wonderful old pitcher, it also belonged to Pat's grandmother, and added my concentrated tea with cold water. The tea was wonderful and hit the spot on this hot summer day. Our music room has a lot of windows and I love all the natural light that comes in each day. When we first moved in I pictured lace curtains hanging on the windows. However, lace curtains can be pretty expensive so my solution was to just use lace panels. At a recent estate sale I found some for 2-dollars each. The panels were long, which is what I was wanting, and they were in great shape. One item that didn't come with the panels were tie backs. Thankfully this was an easy fix, I simply used some lace I already had in my sewing room. Each tie back was then secured with T-pins. I absolutely love how this room turned out. It's very cozy with an elegant Victorian feel. This project was such a huge success that I am now wondering what can be done in our other rooms.